The North Carolina Sports Hall of Fame announced MLB umpire Joe West as part of its 2018 induction class; West will be inducted into the NCSHOF during a May banquet and ceremony at the Raleigh Convention Center. 'Blue Cowboy' Joe West will be inducted in May. NC HOF President Nora Lynn Finch cited the class's achievements, which enrich the state's sports heritage; according to the Hall's website, "The North Carolina Sports Hall of Fame, which inducted its first class in 1963, celebrates excellence and extraordinary achievement in athletics." In June 2017, West officiated his 5,000th regular season game at the Major League level, and is the longest-tenured umpire in MLB history (by years of service) with over 40 games of big league experience. West's 5,074 games through 2017 ranks third on the all-time list, behind National Baseball Hall of Fame Umpire Bill Klemm (5,375 games) and the more recently retired Bruce Froemming (5,163 games). West has also officiated the second-most postseason games in MLB history, behind Gerry Davis. 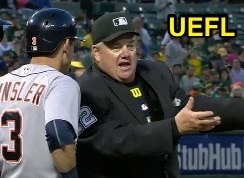 Related Post: Umpire Joe West Officiates 5,000th Regular Season Game (6/20/17). West is the second umpire to be inducted into the North Carolina Sports Hall of Fame. In 1997, the Hall inducted Jim Mills of the National Association of Professional Baseball Leagues, who also officiated college basketball and football in the Atlantic Coast Conference and Southeastern Conference during the 1950s and 1960s after umpiring in baseball's Carolina League in 1954; Mills later served as President of the Carolina League from 1977 to 1983.